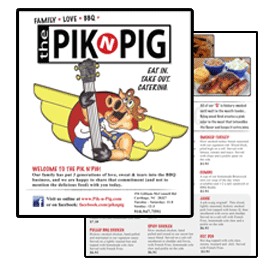 Pik-n-Pig!Three generations of love, sweat and tears, all on one plate. Our entire menu is available for take-out so take a gander and throw us a call! We also provide full-service catering to any event. Fill out the Catering Form and tell us what you want, we'll contact you shortly-after with a quote. Some people say we're crazy for slow cooking our Q all night long over a natural wood fire... We say, "It's not polite to talk with your mouth full!" Throughout the year, the Moore County Chamber of Commerce offers tremendous business building opportunities. One of the most popular is the Business Networking Luncheon (formally the Small Business Networking Luncheon). Its a great place to meet mingle with the Chamber Membership! Remember to bring plenty of business cards!